Also called possessive determiners, possessive adjectives refer to words which modify a noun by showing a form of possession or a sense of belonging to a particular person or thing. This article will provide useful information on the different forms of possessive adjectives, the different functions, some tips on their usage, as well as some examples that can serve as your reference. What are the Definition and Functions of Possessive Adjectives? As mentioned earlier, possessive adjectives are the words used to show a form of possession/ ownership or are used to express a close relationship with someone or something. Moreover, just like the article “the,” a possessive adjective also implies definiteness. Some of the most basic possessive adjectives that are commonly used in the English language are: my, your, our, its, her, his, their, and whose (interrogative). That is his baseball cap. Although the possessive adjective “her” is used in the sample sentence above, it does not necessarily mean that Lea owns the “flight.” The phrase “her flight” just refers to the flight that Lea will take and travel on. We sold our dune buggy yesterday. What is the Difference Between Possessive Adjectives and Possessive Pronouns? Gian’s jacket is black. Hers is brown. In the sentence above, instead of mentioning another name (noun), the possessive pronoun “hers” is used as a replacement. My dirt bike is faster than his moped. What are the Different Forms of Possessive Adjectives? The 1st person possessive adjectives “my” and “our” can be used for both male and female owners. However, the possessive adjective “my” is for singular owners, while the possessive adjective “our” is for plural ones. This means that the dune buggy does not solely belong to the speaker. It can be a family vehicle, for instance. The 2nd person possessive adjective “your” can be used for both male and female owners, and also for both singular and plural owners. The 3rd person possessive adjectives “her,” “his,” and “its” are all used if the owner is singular, while the 3rd person possessive adjective “their” is used only if the owner is in its plural form. Moreover, the possessive adjective “her” is obviously used if the owner is a female and the possessive adjective “his” is for male owners. The words “its” and “it’s” are almost the same except for the presence of an apostrophe in the second word. Although the apostrophe may seem trivial, it actually makes a big difference. Always remember that “it’s” is the contracted form of “it is” or “it has,” so basically if you want to use a possessive adjective in your sentence, you must use the one without an apostrophe. 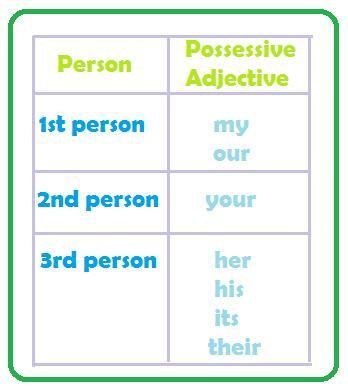 Although possessive adjectives can be confusing at first, especially because they are closely related to possessive pronouns, do not get too intimidated by these. Just by studying the contents of this article and practicing constantly on the application of this kind of words, you will surely be able to fully understand the concept. Anyway, you probably already have been using possessive adjectives for a long time and you’re just not aware of it. What Part of Speech is “LIKE”? © Part of Speech. All rights reserved.